We all love rare mounts in World of Warcraft that you do not see that often. There's still quite a few mounts that you can easily solo farm these days. Let's talk about the next mount in the list, the Reins of the Azure Drake, dropped by no other than Malygos in both 10 and 25 player difficulty of The Eye of Eternity. If you are lucky, you can also get an another mount from him, the Reins of the Blue Drake. Not as cool, but has a higher drop chance. Azure Drake is a beautiful mount and the drop rate is good for a mount. Try your luck today! This fight is very simple and super fast, and afaik all classes have soloed him. From what I have seen, struggling usually occurs during last phase for most players, but in fact it's even easier than the first phases. The fight starts when you interact with the object in the middle of the encounter zone. Malygos comes down after that and you can start to dps immediately after using the object, even if he's still above ground. It won't take long until phase 2 starts. If you're melee, then grab one of the flying discs so you can reach the flying adds. After this, phase 3 starts. You'll get your hands on a drake mount and have to follow 2 simple rules. 1) Move only when you're getting hit by the lightning orbs he tosses. Do not wander far, but instead slowly circle around Malygos. 2) Use the following rotation continuously: 1-1-1-2-3. Even if you are out of energy and cannot cast the next spell in the line, just wait until you can cast it. Do not use your energy on any other abilities and focus on the rotation. This way your drake will be at 100% health all the time and Malygos will get massive damage over time debuffs eventually. Malygos does not drop much wow gold, so you should not farm this boss because of gold. He only drops a few epics that are worth about 50 gold. More if you disenchant them and see how you can make most gold with Abyss Crystals. However, the main reason is the decent chance of dropping both of the flying mounts, Blue and Azure drake. Azure drake's drop rate is about 4% and Blue drake has a higher drop chance, as I've seen it drop 7 times and Azure drake 0 times. Whether you're doing in it 10 or 25 player difficulty, it does not matter. You might have trouble with the enrage timer in the latter though if your dps is not good, and last phase takes a while when you're alone. There's a few ways to get to the raid instance. For horde, take the zeppelin from Orgrimmar to Borean Tundra. For alliance, take the boat from Stormwind to Borean Tundra. For both, take the portal to Dalaran in your Panda capital. Then just find your way to Coldarra in Borean Tundra. 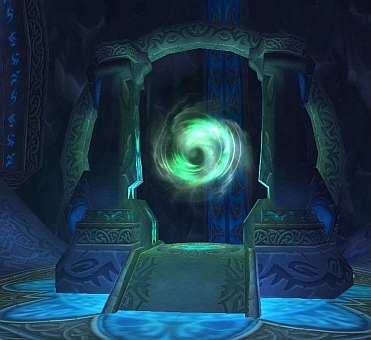 There's Nexus, Oculus and Eye of Eternity dungeons. All of these entrances are in the same spot inside the building. Easiest, the Nexus, being on the floor. Oculus above that and the Eye of Eternity on top.